Join Sierra Adventures on this Wild West horseback riding expedition and see the area from atop your mount, just as the pioneers once did. Intro: Westward Ho! With a shout and a thirst for adventure, the first pioneers led their wagons and rode their horses through the Nevada frontier. The beauty of the Sierra Range is legendary. There are high desert plateaus surrounded by snow capped peaks, dense sage brush contrasted by desert flowers and icy streams. 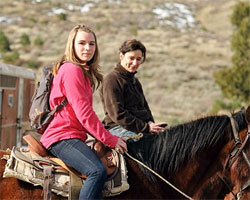 The best way to enjoy this spectacular scenery is on horseback. The Tour: Your horseback expedition begins with a complimentary shuttle pickup at any local hotel. A continental breakfast will be provided for you en route to your destination. Your guide will set you up with a compatible ride and lead your group on a scenic tour at your pace. Suggested Clothing and Gear: Loose Clothes / Long Pants / Binoculars / Camera / Wool Socks / Hiking Boots / Hat / Sun Glasses.